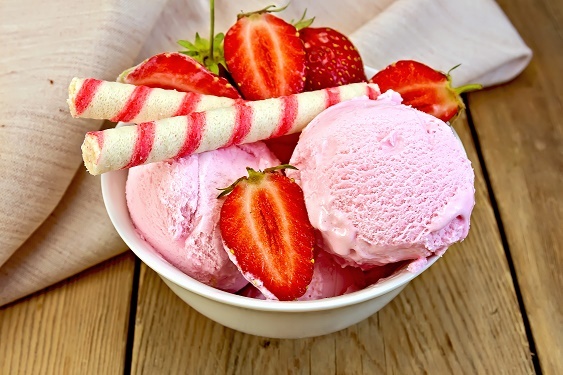 Today, January 15, 2015 is National Strawberry Ice Cream Day (USA). Ice cream is a frozen food usually made from dairy products, such as milk and cream and often combined with fruits or other ingredients and flavors. Ancient civilizations have served ice for cold foods for thousands of years. Around 200 B.C the Chinese served a frozen mixture of milk and rice. During Nero’s time of ruling over the Roman Emperor (37–68 AD) he had ice brought from the mountains and had it mixed it with fruit. In Europe the first recipe for flavored ices appears in France around 1674, and made its appearance to England in the 18th century. In 1718 in England’s capital, London, was published a book titled “Mrs. Mary Eales’s Receipts” which contained an ice cream recipe. In the “New World” (USA) ice cream sodas was first introduced in 1874 and by the late 19th century the ice cream sundae came to be. During the American Prohibition (US outlawed the making and serving of any alcohol) the ice cream parlor to some extent replaced the outlawed bars and saloons. In 1851, in the city Boston, the first commercial factory was built for the production of ice cream. Americans are the number one consumers of ice cream, an average person living in the USA eats 48 pints of ice cream a year. In 2011 the total amount of ice cream consumed in the United States was 1.58 billion gallons. To make one gallon of ice cream, it requires 192 ounces of milk. Dairy cows produce about 1024 ounces of milk in a day (about 128 8 oz. glasses of milk). That means, if we have calculated appropriately, one dairy cow makes approximately 5.5 gallons of ice cream every day. Let’s give thanks to the cow for ice cream. Really without them, we would not have ice cream, nor would January 15th each year in the United States, be National Strawberry Ice cream Day. For those of you who are adventurous and would like to make homemade ice cream, here is a recipe we found on food.com by Elizabeth Knicely. The recipe calls for fresh strawberries. But if you are unable to find fresh ones at your local market, frozen will work as will. Combine strawberries, lemon juice, and 1/2 cup of sugar in a bowl and stir. Allow to sit for up to 2 hours. Strain berries and reserve the juices. In a medium bowl mix milk and remaining sugar until sugar is dissolved. Stir in heavy cream, leftover juice from the berry mixture, vanilla, and mashed strawberries. Turn on Ice Cream Machine and pour mixture into the frozen freezer bowl for about 20 minutes. Add the rest of the strawberries and mix for another 5 minutes. The ice cream will be very soft and creamy. We transferred ours to a container and stuck it in the freezer for about an hour to thicken it up a little the way we like it. I am looking forward to trying out some other new ice cream recipes now that I see just how easy it is to do! In fact, I have a container of blueberries in the kitchen that I think would be great in ice cream too! This entry was posted in Dessert, National Food Days (USA) and tagged Adobe Photoshop, Alexander the Great, Bald Eagle, England, France, Ice cream, Lemon, London, New World, Pinterest, Rosaceae, Strawberry, Strawberry Ice Cream, White House, William Prout. Bookmark the permalink. LOL…just make sure he’s on time or it melts! !